Fractures of the proximal humerus account for approximately 6% of all adult fractures . Some (distinct) undisplaced fractures may be sufficiently treated with conservative therapy , while displaced and unstable fractures need to be treated surgically [3, 4]. Remarkably, there is an evidence that dislocated three- and four-party fractures may be sufficiently treated conservatively . A meta-analysis, nonetheless, questioned the benefits of surgery after one or two years . According to Zhu et al., locking plate fixation leads to a better functional outcome compared to the locking nail approach . The loss of surgical fixation depends on the age, local bone morphogenic density (BMD) and anatomic reduction, especially of the medial cortical support/calcar [8-12]. After surgery, predictable factors of implant failure with loss of fixation are rare, and radiographic detection of cut-out  and osteonecrosis, especially in complex fractures [14-16], remains challenging. In trochanteric fractures of the hip, measuring the tip-apex distance is a valid tool for describing the position of the screw  and to predict the potential cut-out [18-22]. Therefore, we developed an easy approach to assess the plate position after open reduction and internal fixation (ORIF) in proximal humeral fractures, which is comparable to the tip-apex distance in proximal femoral fractures. The objective of this retrospective study was to determine whether the humeral tip-apex-distance (HTAD) in humeral plate osteosynthesis was a reliable factor for assessing the outcome of these fractures and a predictor of postoperative failure, such as cut-out. surgical treatment with the PHILOS®-plate. Four hundred and eight patients fulfilled the criteria. Filemaker-datasets were built based upon operation protocols. Soft tissue injury according to Tscherne/Oestern  and Gustilo/Anderson [24, 25]. The type of fracture was classified according to Neer  and Müller/AO . X-ray imaging was conducted during five different time points (on average, 13.01, 64.78, 178.75, 213.34, and 165.80 days after accident) and in at least two X-ray planes. The angle could be confirmed by the great and minor tubercle and location of the osteosynthesis material. Right angle screws could be scaled the whole length (Fig. 1). Fig. (1). Measurement of the humeral tip-apex-distance (HTAD). Parallel to the screw-axis (red line) and beginning on the tip to the medial edge of the humeral corticalis (green line), the distance was scaled to the outer cortical limit. The humeral tip-apex-distance was defined based on Baumgaertner et al. for femoral head fractures . The authors defined the TAD as the distance in mm from the tip of the screw to the outer cortical limit of the femoral head in extension of the screw. Alteration in the TAD was considered proof of a positional change in the bone. We applied this definition for the tip-apex-distance of most cranial screws in the humeral head. Parallel to the screw-axis, a second line was drawn for scaling the distance from the medial edge of humeral corticalis to the tip of the screw (Fig. 1). Definition of sufficient reduction was documented with criteria 1+2; otherwise, the reduction was classified as “insufficient”. Patients were re-evaluated after two weeks, two months, six months and eight months with X-ray examination. However, each patient’s compliance resulted in variable time points for the X-rays. Postoperative treatment was generally performed with limited abduction and passive motion for six weeks, which was followed by functional training by physiotherapists. Statistical analysis and graphical assessment were performed with GraphPad Prism (version 5.04, GraphPad Software, La Jolla California USA). The following parameters were used: standard deviation, mean, median and ANOVA. P-values ≤0.05 were set as statistically significant. Four hundred and eight patients were included in this study. Their mean age was 66.62 ±15.72 [50.9-82.3] years; 63.54% were female, and 36.46% were male. Fracture classification according to Neer and Müller/AO is shown in Fig. (2) and Fig. (3). In most cases, Neer III and IV (Fig. 2) and AO A3 and C2 (Fig. 3) fractures could be detected. Fig. (2). Neer classification of the patient cohort. 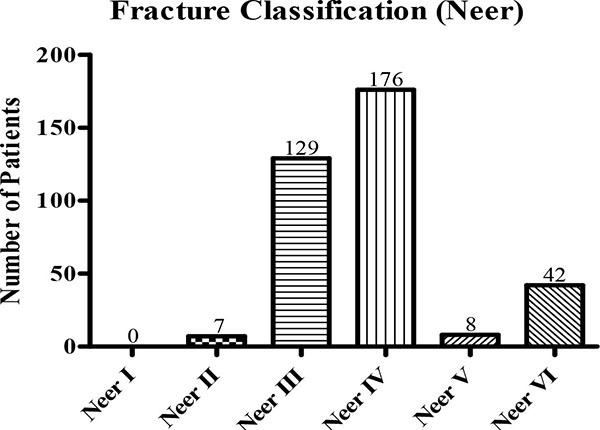 Fracture classification according to Neer shows predominantly types IV and III in the investigated cohort, accounting for 85% fractures. Fig. (3). Müller/AO classification of the patient cohort. 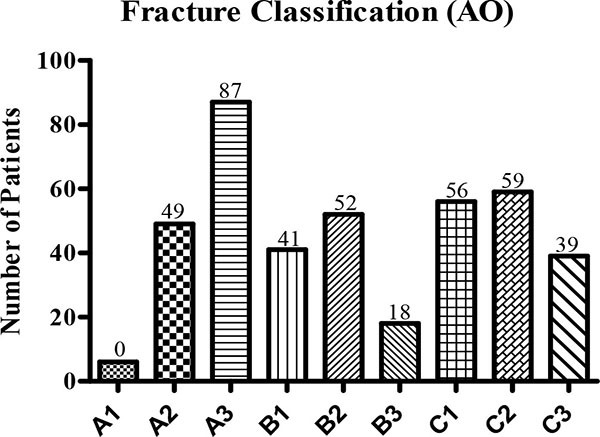 Fracture classification according to Müller/AO primarily shows A3, C2 and C1 fractures. When analyzing the causes of injury, we found that most accidents could be attributed to a fall, which was the case in 210 patients (51.72%); low-energy trauma was observed in 84 (20.69%) patients, and high-energy trauma was observed in 79 (19.46%) patients, which was followed by 33 (8.13%) patients who had another cause of injury (Fig. 4). Fig. (4). Causes of injury in the investigated group. 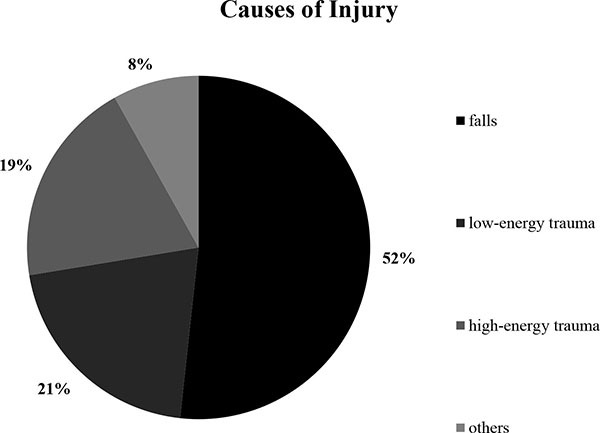 Causes of injury were commonly falls (52%), which was followed by low-energy trauma in 21%. Comorbidities were evaluated and were highly heterogeneous. We detected hypertension in 94 patients (23.04%), obesity in 44 (10.78%), an apoplectic insult in 25 patients (6.13%), malignancies in 27 patients (6.62%) and alcohol abuse in 31 patients (7.6%), while 65 had other comorbidities (15.94%). Fig. (5). Measured time from fracture to operative treatment. The time from accident to operation was found to be on average of 7.15 days; the mode was five days. After admission to the hospital, the elapsed time from accident to operation was an average of 7.15 days and could be divided into several time frames. For most patients, up to 5 days were needed to perform the surgery following injury. 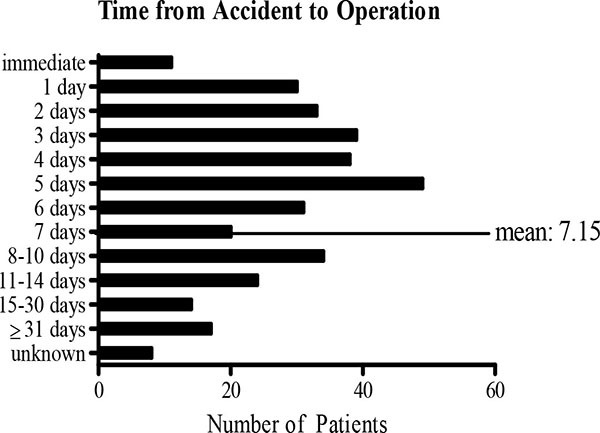 By contrast, few individuals were treated later than 15 days after their accident (Fig. 5). Finally, surgical techniques have been compared among the patients. 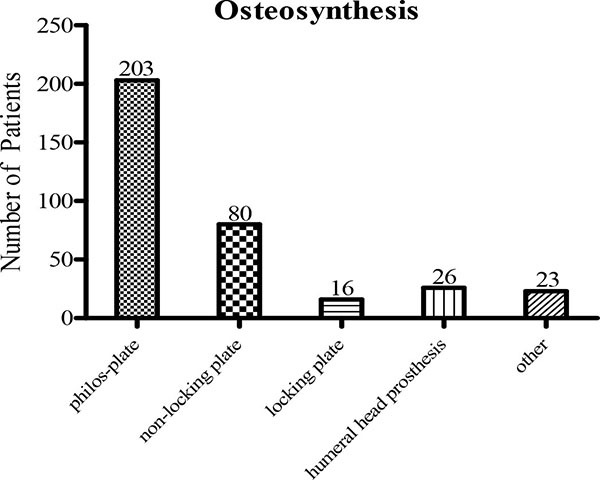 Osteosynthesis was primarily performed by PHILOS®-Plate in 203 cases (58.33%), non-locking plate in 80 patients (22.99%), locking plate in 16 patients (4.6%) and humeral head prosthesis in 26 patients (7.47%); 23 underwent other operational procedures (6.61%) (Fig. 6). Fig. (6). Different types of ORIF. Osteosynthesis was performed by PHILOS®-Plate in most cases, which was followed by a non-locking plate. The representative subgroup investigated for reduction consisted of 94 patients; 49 were considered sufficiently treated (52.13%). On the other hand, 45 patients (47.87%) were considered to be insufficiently supplied. Fig. (7). Humeral tip-apex-distance (HTAD) determined at three time points. From the beginning (Timepoint 1) to the third measurement (Timepoint 3), the distance from the tip to apex increased, revealing significant differences between timepoints 1 and 3. In all X-rays, the mean tip-apex distance was measured. As expected, the first X-ray (taken an average of 13.1 days after the accident) revealed an HTAD of 99.93%. During the second X-ray, no significant difference was found (101.66%; an average of 64.78 days after the accident), while values of 85.86% (178.75) could be detected in the third, 83.04% (213.34) in the fourth and 60.21% (165.80) in the fifth measurements (Fig. 7). 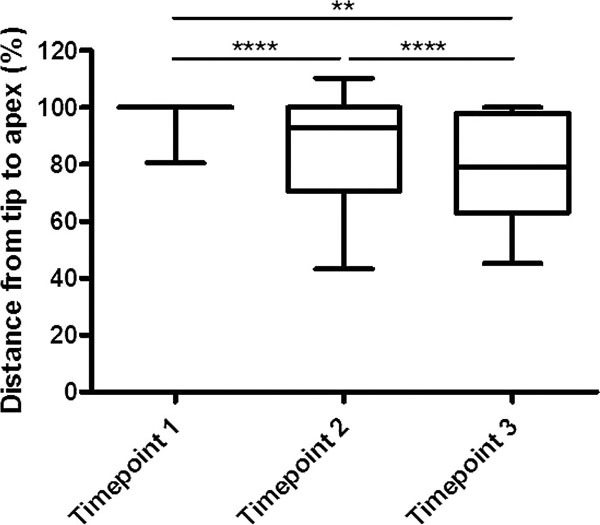 The measured tip apex distance was significantly greater from the first to the third X-ray in patients with radiologically stable osteosynthesis (95.41%±4.753) compared to those with instable fixation (77.69%±7.093, p=0.0443), (Fig. 8). Morbidities were analyzed, including the number of comorbidities and their combinations (Table 1). Table 1. Parameters investigated in relation to the HTAD and their predictive value. An adequate reduction, short time of surgery and providing continuous passive motion treatment (CPM) significantly affected the HTAD (Table 1). Fig. (8). 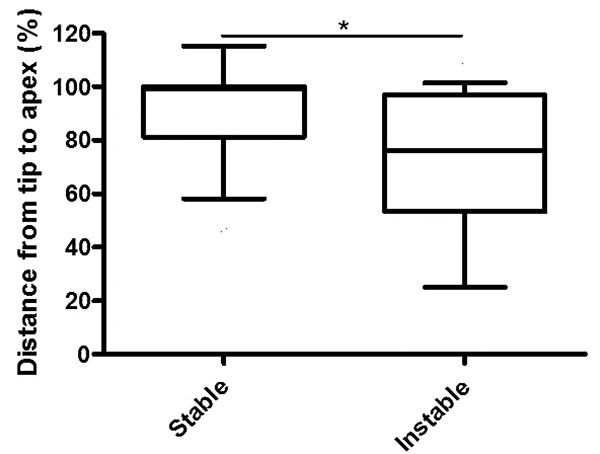 Humeral tip-apex-distance (HTAD) over time in stable vs. instable reduced fractures. The relationship from the first to the third X-ray is significantly higher (lower difference in the measured HTAD) in a stable situation compared to an instable situation. Proximal humeral fractures in the elderly have a poor outcome, and open reduction with locking plate osteosynthesis accounts for substantial complication rates that range from 49% up to 76% [28-32], with secondary dislocation/cutting out as one major problem . Although intraoperative failures are frequently preventable , postoperative X-rays are often difficult to evaluate, and comparison remains challenging [13, 35, 36], especially because missing cortical support causes a poor outcome . Although some key aspects of postoperative failure have been identified, a simple approach to evaluating the postoperative result remains to be elucidated. By measuring the humeral tip-apex-distance, a simple approach for quantifying the postoperative status is presented. A shortage in the HTAD means there is convergence of the screw-tip to the outer bone limit, and an increase indicates removal of the screw-tip from the outer bone limit. Because the HTAD of the first X-ray is normally defined as 100%, the distance determined during the following X-rays normally falls below 100%, but it may also exceed 100% because of imaging variations. From the first to the third measurement, the best results could be found in this study. Our results demonstrate a physiological sintering of head fragments in all patients provided with osteosynthesis of the first screw over time, which was indicated by an increasing HTAD - and decreasing distance percentage in relation to the first X-ray distance - from the first to the third X-ray. In our study, two-part fracture was the most prevalent type, as was similarly demonstrated by Euler et al. Consequently, the most common operative procedure was plate osteosynthesis (85.9%), which was followed by humeral head prosthesis (7.5%); these results are comparable to the retrospective study by Katthagen et al. . While the average age in our cohort was 66.62 years, which is very close to a Swedish study (66.8), and falls were the main cause of injury in both studies, the gender was predominantly female (1.74:1), which is consistent with a large study in which women had a higher risk of fractures in the humerus than men  as well as with a great prospective multicenter study . If surgery was performed more than 5 days after the accident, an increased risk of complications could be observed . In our population, 57.5% of interventions were conducted during this critical time period. Data on the ideal time of surgery are rare. Südkamp et al. reported an average time of 4.1±3.4 days  from injury to operation, but the authors did not correlate the time with the outcome. Because “cutting out” remains a major issue the surgeon should consider, and up to 14% of patients suffer from screw perforation, especially in ankle-stable plates , regular postoperative radiologic controls are obligatory; however, evaluation remains difficult. Several parameters, such as varus displacement or medial comminution, were significantly correlated with reduction loss [10, 42], but more specific parameters are needed to detect postoperative failures early. In our population, patients with an instable fixation, especially those missing cortical support at the calcar, tend to a greater HTAD in postoperative X-rays. The cortical support on the medial column is of great importance for bone healing in the proximal humerus , especially in complex fractures [31, 42, 44-46]. The HTAD seems to illustrate the importance of a stable reduction in operative treatment because it is proportionally greater in the early postoperative radiographs if the medial column is not correctly fixed. Further parameters correlated with a greater HTAD, such as morbidity, could act as surrogate parameters for low bone quality or low patient compliance. We observed that multiple comorbidities significantly affected the HTAD. While age lower or higher than 65 years did not affect the HTAD, neither did the type of accident, polytrauma, BMI, gender, time between accident and admission to hospital/operation, osteoporosis, beginning of mobilization, locking plate vs. non-locking plate, physiotherapy or period of hospitalization. Because it remains to be determined which group of patients benefits from implant augmentation [16, 47, 48], especially in angle stable osteosynthesis , some suggest multifragmentary fractures and elderly patients with a low BMD should be considered for this procedure . From our point of view, we recommend patients with multiple comorbidities or fragmented calcar, as a result of the greater HTAD over time in this special subgroup, should be considered for the procedure. Such treatment could prevent the growing HTAD, which should be further analyzed in future studies. One major limitation of this study is the variation in the measurement time. The HTAD highly depended on patients presenting for follow up, which was influenced by varying compliance in the studied group. Moreover, we could demonstrate that a short time before operation and providing CPM help to maintain a small HTAD. Although data on the former is rare, we presume that a shorter time before surgery correlates with simple fractures and is therefore more likely to end in a stable fixation, which is in agreement with Yang et al. . The latter is consistent with data in the literature [49-51]. Taken together, this study illustrates the importance of anatomical reduction, especially on the medial corticalis, and the benefit of measuring the HTAD in postoperative X-rays. This measurement can help evaluate the status of fixation and detect early loss of reduction, allowing for prompt decisions about when to intervene and when to practice watchful waiting. Based on this study, we recommend regular X-ray controls with subsequent recording of the HTAD and passive mobilization by CPM. The authors declare that no conflicts of interest exist that could affect this paper. Additionally, no funding was obtained to support this paper. No funding was received. DS and TH contributed equally to the manuscript. Handoll HH, Ollivere BJ. Interventions for treating proximal humeral fractures in adults. Cochrane Database Syst Rev 2010; (12): CD000434. Wang G, Mao Z, Zhang L, et al. Meta-analysis of locking plate versus intramedullary nail for treatment of proximal humeral fractures. J Orthop Surg 2015; 10: 122. Murray IR, Amin AK, White TO, Robinson CM. Proximal humeral fractures: Current concepts in classification, treatment and outcomes. J Bone Joint Surg Br 2011; 93(1): 1-11. Krettek C, Wiebking U. Proximale Humerusfraktur: Ist die winkelstabile Plattenosteosynthese der konservativen Behandlung überlegen? Unfallchirurg 2011; 114(12): 1059-67. Dai J, Chai Y, Wang C, Wen G. Meta-analysis comparing locking plate fixation with hemiarthroplasty for complex proximal humeral fractures. Eur J Orthop Surg Traumatol 2014; 24(3): 305-13. Zhu Y, Lu Y, Shen J, Zhang J, Jiang C. Locking intramedullary nails and locking plates in the treatment of two-part proximal humeral surgical neck fractures: A prospective randomized trial with a minimum of three years of follow-up. J Bone Joint Surg Am 2011; 93(2): 159-68. Krappinger D, Bizzotto N, Riedmann S, Kammerlander C, Hengg C, Kralinger FS. Predicting failure after surgical fixation of proximal humerus fractures. Injury 2011; 42(11): 1283-8. Wu JW, Shen HL, Liu LM, Gao ZH. Analysis of early failure of the PHILOS in proximal humerus fractures. Beijing Da Xue Xue Bao 2016; 48(1): 683-5. Jung S-W, Shim S-B, Kim H-M, Lee J-H, Lim H-S. Factors that influence reduction loss in proximal humerus fracture surgery. J Orthop Trauma 2015; 29(6): 276-82. Newman JM, Kahn M, Gruson KI. Reducing postoperative fracture displacement after locked plating of proximal humerus fractures: Current concepts. Am J Orthop 2015; 44(7): 312-20. Schliemann B, Wähnert D, Theisen C, et al. How to enhance the stability of locking plate fixation of proximal humerus fractures? An overview of current biomechanical and clinical data. Injury 2015; 46(7): 1207-14. Spross C, Jost B, Rahm S, Winklhofer S, Erhardt J, Benninger E. How many radiographs are needed to detect angular stable head screw cut outs of the proximal humerus - a cadaver study. Injury 2014; 45(10): 1557-63. Patel S, Colaco HB, Elvey ME, Lee MH. Post-traumatic osteonecrosis of the proximal humerus. Injury 2015; 46(10): 1878-84. Gavaskar AS, Tummala NC. Locked plate osteosynthesis of humeral head-splitting fractures in young adults. J Shoulder Elbow Surg 2015; 24(6): 908-14. Euler SA, Hengg C, Wambacher M, Spiegl UJ, Kralinger F. Allogenic bone grafting for augmentation in two-part proximal humeral fracture fixation in a high-risk patient population. Arch Orthop Trauma Surg 2015; 135(1): 79-87. Abdulkareem IH. A review of tip apex distance in dynamic hip screw fixation of osteoporotic hip fractures. Niger Med J 2012; 53(4): 184-91. Geller JA, Saifi C, Morrison TA, Macaulay W. Tip-apex distance of intramedullary devices as a predictor of cut-out failure in the treatment of peritrochanteric elderly hip fractures. Int Orthop 2010; 34(5): 719-22. Rubio-Avila J, Madden K, Simunovic N, Bhandari M. Tip to apex distance in femoral intertrochanteric fractures: a systematic review. J Orthop Sci 2013; 18(4): 592-8. Wright J, Kahane S, Moeed A, MacDowell A. Accuracy of the surgeons eye: Use of the tip-apex distance in clinical practice. Injury 2015; 46(7): 1346-8. Tscherne H, Oestern HJ. Die Klassifizierung des Weichteilschadens bei offenen und geschlossenen Frakturen. Unfallheilkunde 1982; 85(3): 111-5. Gustilo RB, Anderson JT. Prevention of infection in the treatment of one thousand and twenty-five open fractures of long bones: retrospective and prospective analyses. J Bone Joint Surg Am 1976; 58(4): 453-8. Gustilo RB, Mendoza RM, Williams DN. Problems in the management of type III (severe) open fractures: A new classification of type III open fractures. J Trauma 1984; 24(8): 742-6. Müller ME. The comprehensive classification of fractures of long bones. Berlin: Springer 1990. Clement ND, Duckworth AD, McQueen MM, Court-Brown CM. The outcome of proximal humeral fractures in the elderly: Predictors of mortality and function. Bone Joint J 2014; 96-B(7): 970-7. Edwards SL, Wilson NA, Zhang L-Q, Flores S, Merk BR. Two-part surgical neck fractures of the proximal part of the humerus. A biomechanical evaluation of two fixation techniques. J Bone Joint Surg Am 2006; 88(10): 2258-64. Geiger EV, Maier M, Kelm A, Wutzler S, Seebach C, Marzi I. Functional outcome and complications following PHILOS plate fixation in proximal humeral fractures. Acta Orthop Traumatol Turc 2010; 44(1): 1-6. Maier D, Jaeger M, Izadpanah K, Strohm PC, Suedkamp NP. Proximal humeral fracture treatment in adults. J Bone Joint Surg Am 2014; 96(3): 251-61. Zyto K, Ahrengart L, Sperber A, Törnkvist H. Treatment of displaced proximal humeral fractures in elderly patients. J Bone Joint Surg Br 1997; 79(3): 412-7. Kathrein S, Kralinger F, Blauth M, Schmoelz W. Biomechanical comparison of an angular stable plate with augmented and non-augmented screws in a newly developed shoulder test bench. Clin Biomech (Bristol, Avon) 2013; 28(3): 273-7. Chowdary U, Prasad H, Subramanyam PK. Outcome of locking compression plating for proximal humeral fractures: a prospective study. J Orthop Surg (Hong Kong) 2014; 22(1): 4-8. Kachramanoglou C, Chidambaram R, Mok D. Four-part proximal humeral fractures: diagnosis with the sunset sign on anteroposterior radiograph. Ann R Coll Surg Engl 2010; 92(7): 599-604. Mora Guix JM, Gonzalez AS, Brugalla JV, Carril EC, Baños FG. Proposed protocol for reading images of humeral head fractures. Clin Orthop Relat Res 2006; 448(448): 225-33. Unger S, Erhart S, Kralinger F, Blauth M, Schmoelz W. The effect of in situ augmentation on implant anchorage in proximal humeral head fractures. Injury 2012; 43(10): 1759-63. Katthagen JC, Grabowski S, Huber M, Jensen G, Voigt C, Lill H. Epidemiology and treatment reality of proximal humeral fractures at a level-1 trauma center. Obere Extremität 2016; 11(2): 112-8. Bergdahl C, Ekholm C, Wennergren D, Nilsson F, Möller M. Epidemiology and patho-anatomical pattern of 2,011 humeral fractures: Data from the Swedish Fracture Register. BMC Musculoskelet Disord 2016; 17: 159. Südkamp N, Bayer J, Hepp P, et al. Open reduction and internal fixation of proximal humeral fractures with use of the locking proximal humerus plate. Results of a prospective, multicenter, observational study. J Bone Joint Surg Am 2009; 91(6): 1320-8. Siebenbürger G, Van Delden D, Helfen T, Haasters F, Böcker W, Ockert B. Timing of surgery for open reduction and internal fixation of displaced proximal humeral fractures. Injury 2015; 46(Suppl. 4): S58-62. Matassi F, Angeloni R, Carulli C, et al. 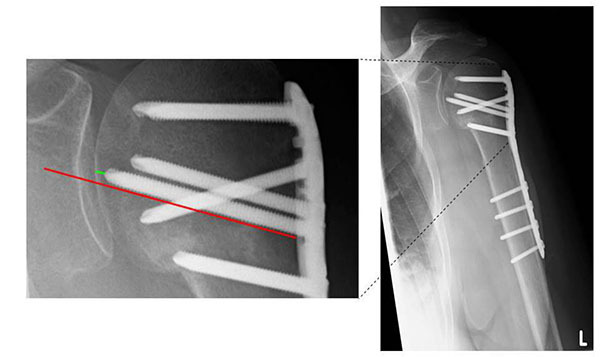 Locking plate and fibular allograft augmentation in unstable fractures of proximal humerus. Injury 2012; 43(11): 1939-42. Jung W-B, Moon E-S, Kim S-K, Kovacevic D, Kim M-S. Does medial support decrease major complications of unstable proximal humerus fractures treated with locking plate? BMC Musculoskelet Disord 2013; 14: 102. Yang H, Li Z, Zhou F, Wang D, Zhong B. A prospective clinical study of proximal humerus fractures treated with a locking proximal humerus plate. J Orthop Trauma 2011; 25(1): 11-7. Zhang L, Zheng J, Wang W, et al. The clinical benefit of medial support screws in locking plating of proximal humerus fractures: A prospective randomized study. Int Orthop 2011; 35(11): 1655-61. Erhart S, Zegg M, Kralinger F, Kammerlander C, Roth T. Fast and easy preoperative estimation of cancellous bone mineral density in patients with proximal femur fractures. Arch Orthop Trauma Surg 2015; 135(12): 1683-9. Kammerlander C, Neuerburg C, Verlaan J-J, Schmoelz W, Miclau T, Larsson S. The use of augmentation techniques in osteoporotic fracture fixation. Injury 2016; 47(Suppl. 2): S36-43. Bahrs C, Rolauffs B, Dietz K, Eingartner C, Weise K. Clinical and radiological evaluation of minimally displaced proximal humeral fractures. Arch Orthop Trauma Surg 2010; 130(5): 673-9. Babst R, Brunner F. Plating in proximal humeral fractures. Eur J Trauma Emerg Surg 2007; 33(4): 345-56. Hodgson S. Proximal humerus fracture rehabilitation. Clin Orthop Relat Res 2006; 442(442): 131-8.